Primark cordon expected to be in place "a minimum of four months"
A cordon around the burnt out Primark in Belfast City Centre is expected to be in place until at least January. 14 businesses are inside that zone. Belfast Lord Mayor, Deidre Hargey says it's still not clear whether the front of the historic building will be saved - but engineers will be looking into it. Other firms in the area are being promised support to deal with the situation. 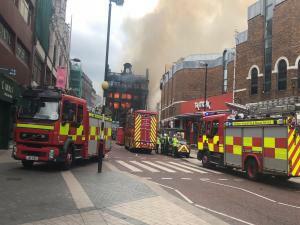 Councillor Hargey said:"Belfast City Council continues to work with its city partners to look at ways we can revive this part of the city centre in the wake of the fire and the ongoing recovery operation. "In the coming days and weeks, we will be implementing a range of measures to help businesses who are struggling in the current situation. Alongside the group meetings, the council has continued to hold one to one meetings with businesses affected to understand all of the individual issues. "As well as erecting signage to encourage and direct footfall, Council along with other agencies and government departments are working together to find alternative premises for businesses and arranging initiatives for affected traders to provide advice in respect of rates and employability. "Belfast City Council and its city partners is also planning a campaign aimed at sustaining visitors to the city and supporting retailers to run over the next four months.